I ve booked a villa in Cyprus for BERU. Do you fancy coming? Stupid question! And so it was that on Monday March 4th 2013, Mike and XYL Hilary, Peter G3SJX and XYL Marjorie, and Steve G3UFY playing gooseberry, clambered aboard an Easyjet airbus in the freezing cold of an early Gatwick morning, bound for warmer climes and a short holiday before the all-important contest. 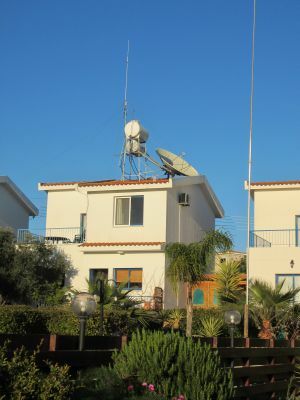 Doms Villa, as advertised in RadCom, comes complete with a 100W transceiver and simple antennas ideal for a holiday operation. Dom had no objections to us putting up some extras if required, but advised that there was a ham just down the road and we should check with him as he did a bit of contesting. The �ham down the road� turned out to be Norman, 5B4AIE, a good friend of Dom. He had no objections, and would we like to borrow his FT1000MP MkV Field … and his amplifier … and his full-size 40m vertical … and his contest call C4I? Christmas had come early! So we travelled light, in equipment terms, taking only cans, keys, a lap-top, a large variable capacitor and some RG213 cable to replace the rather flimsy feeder to the HF vertical. 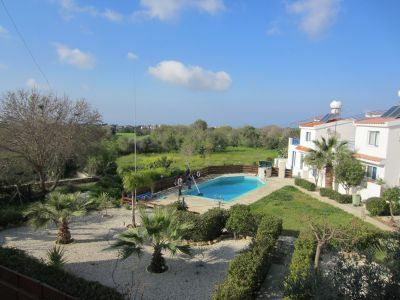 The villa is in Tremithousa, in the northern outskirts of Paphos, about 1000ft asl and on rising ground. Although somewhat screened to the northeast the takeoff to Africa, Europe and North America is superb, as is the view of the sea over the fields at the rear. It is one of a small group of holiday villas clustered round a communal lawn area and swimming pool. We arrived to find the 40m vertical already erected in the garden and the rig and amplifier in place in the living room. 5B/G3VYI was on the air in no time!
. 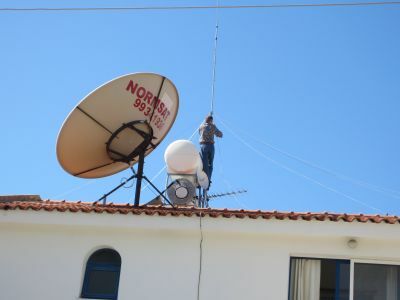 Norman arrived the next day with ladders and it was decided to sort the antennas as soon as possible, after which we could sight-see with a clear conscience. The HF antenna was a WIMO GP3 triband vertical, with two wire radials for each band, mounted on a short tubular mast above the solar water-heating panels on the roof. Access was easy from the rear balcony and the feeder was soon replaced with something more sensible. There was also a 40m inverted vee with one leg in the clear but the other draped over the roof. Nothing would induce this antenna to behave until it was realised that the concrete roof of the villa was full of reinforcing bar. The addition of a short pole to the front balcony railings lifted the wire a couple of feet clear of the roof … job done. In the event, we didn�t use it, preferring the vertical. For 80m we put up a simple sloping wire from the base of the tribander to the rear lawn, series tuned with the large variable capacitor and fed against four quarter-wave radials. Everything tuned and tested out OK … we were ready. We could be tourists, at least until Saturday … and we made the best of the opportunity. 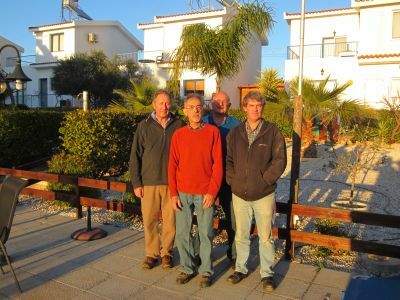 On Wednesday evening we went out for a meal with some of the local gang: Alan 5B4AHJ and Beryl, David 5B4AJT and Chris, Bob 5B4AGN and Karen and, of course, Norman. The venue was �The Fountain of Gerolakkos� a delightful taverna at Tsada, way up in the hills overlooking Paphos. The food, wine, beer and company were all superb and the view from the road outside stunning with the stars bright in a clear sky and the lights of the town far below. Cyprus time is two hours ahead of UTC, so the contest started at noon local. Any fears we might have had about our signals from simple verticals were soon allayed as Mike racked up 96 Qs in the first hour on 28MHz. Some early problems with a slow relay in the amplifier cleared up after a couple of hours and were probably due to it not having been used for some time. One item which we didn�t, but should have taken was an antenna switch � changing antennas involved disconnecting one feeder from the amp and connecting another, so quick band changes were a no-no. Conditions were good and band noise levels low compared with London! 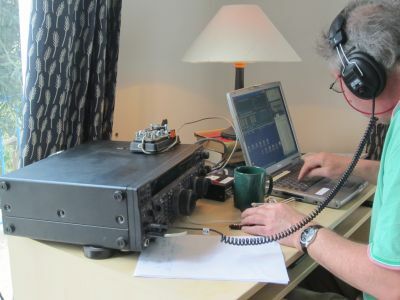 One disappointment was hearing VE7CC CQ-ing on 80m and to have him not hear me call. Also on 80m, sorry to have had VK3MI (I think it was) call me twice and me not able to dig him out of the noise. I think if I�d been more familiar with the DSP I might have been able to do it. And so we took down the sloper, cleared up the house, said our goodbyes to Norman and headed back to the Fountain for our last meal in Cyprus, blissfully ignorant of what lay in store. Monday afternoon and the plane was late, but we didn�t mind as we stood in the warm sun while they refuelled it and loaded the luggage. It was a little disturbing when the pilot apologised for the delay, blaming it on having to be de-iced twice before they could take off on the way out. Even so, I don�t think anyone was prepared for what we saw as we popped out of the clouds over Gatwick. Total white-out everywhere. Blizzard conditions and a howling gale blowing. A line of at least a dozen snowploughs and gritters on the taxiway, their yellow flashing lights garish in the half-dark. The aircraft lurching about so much that when the pilot touched down without a bump there was a spontaneous round of applause in the cabin. Nearly an hour�s wait for the service bus to the car park. The M23 southbound closed. In fact, most of South East England closed. It took me longer to get from Gatwick to Croydon than from Cyprus to England. Still, it�s good to be home. Yeah � right!